NORMA ISO 3874-1997 SULLA MOVIMENTAZIONE DEI CONTAINER. Waldem Container Box può offrire in vendita o noleggio I container di seguito descritti . • For the purpose of container handling and securing, a “loaded container” is a container other than in the tare (empty) condition. • Unless otherwise confirmed, containers should be treated as loaded. 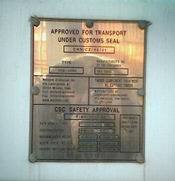 • The term loaded means the maximum gross weight rating of the container. • Wind and other environmental conditions must be considered when handling or securing containers. - to avoid unacceptable load concentrations. Eccentricity of the center of gravity for the loaded container varies with the distribution of load within the container; designers of containers and handling equipment should take this fact into account. As an example, when 60% of the load by mass is distributed in 50% of the container length measured from one end, the eccentricity corresponds to 5%. • Care shall be taken to ensure that the equipment used is suitable for the load and is safely attached to the container and that the container is free to be handled. • In the case of a single-point lift, special attention should be paid to the risk of the container tilting owing to eccentricity of the centre of gravity. • Care shall be taken when lifting a container whose centre of gravity is mobile or eccentric, e.g. a tank container, a bulk container, a container with a liquid bulk bag, a container with hanging cargo or a thermal container with a refrigerating unit (integral or clip-on). • Containers may be handled by methods other than those specified in the following section but only after careful evaluation of the equipment by means of which the container is to be handled and of the methods of operation envisaged, with respect to international container standards. • Empty containers (except empty plaContainerInverter orm based containers and plaContainerInverter orm based with ends, which shall not be lifted other than with forces applied vertically from the top corners). • When lifting empty containers, the sling angle should not be less than 60 degrees from the horizontal plane. • Ten foot containers using a sling angle of not less than 60 degrees to the horizontal plane. 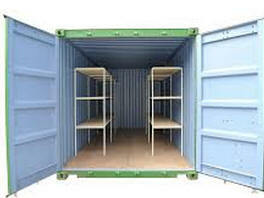 • Containers may be lifted from the side apertures of all four bottom corner fittings by means of a sling. The attachment fittings should not exert forces more than 1.5 inches away from the outer face of the Corner Fitting. Container Size Designation Lifting Angle, a, min.